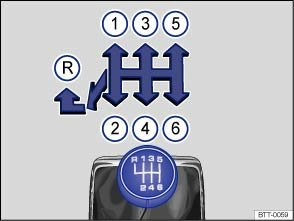 The positions of the individual driving gears are shown on the gearshift lever . Push the gearshift lever fully to the left and then to the front in the reverse gear position . When the engine is running, the vehicle will start to move as soon as a gear is engaged and the clutch released. This also applies when the handbrake is on.